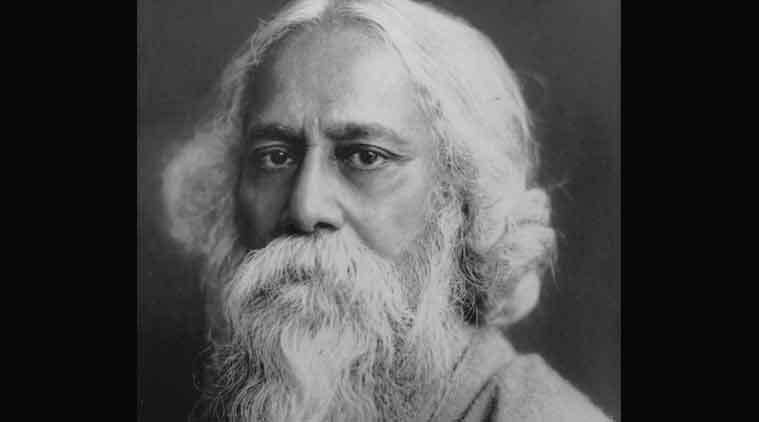 Rabindranath Tagore set the tune to both the national anthems of India and Bangladesh; the tune for the Sri Lankan national anthem was also suggested by him. In the last week of April, Abdul Majid Sheikh’s book, Lahore: 101 Tales of a Fabled City (2015), was released. It again brought to the forefront that Pakistan’s anthem was first written by a Hindu poet of Lahore, Jagannath Azad. Three other national anthems — of India, Sri Lanka and Bangladesh — were composed as poems by another great Hindu, Rabindranath Tagore. Sheikh says, “The Lahore poet Azad was commissioned by Quaid-e-Azam to write Pakistan’s national anthem three days before the creation of Pakistan in 1947.” He claims that Muhammad Ali Jinnah actually approved the song by Azad and the text was publicised, but can quote only the two top lines: “Ae sarzameene paak/ Zarray hain tere aaj sitaron se tabnaak/ Roshan hai kehkashaan se kaheen aaj teri khaak/ Ae sarzameene paak (O, sacred land of Pakistan, the stars themselves illuminate each particle of yours/ rainbows illumine your very dust).” Azad thought the task was urgent and finished the poem in three days. First there is the operation; then there are the optics. Based on available reports, the cross-border operation in Myanmar seems to have been professionally executed. The army’s statement was appropriately terse. The operation was not without precedent. But the government deserves credit for putting in place all the diplomatic, intelligence and other ingredients that made it possible in quick time. But the messaging around the operation seems to have muddied the waters. Some of the muddying is on familiar themes. The chest-thumping of some ministers seems quite out of proportion and potentially dangerous. India has a more complicated history with effective cross-border operations than is usually acknowledged. The political narrative around the operations, not the facts, is what seems to be changing. But let us look at the politics of messaging in different frames. Once the euphoria over `Operation Myanmar’ subsides, hard questions will still remain to be answered: has India turned the clock back on its longest running insurgency after army commandoes hot-pursued Naga underground fighters belonging to the Khaplang faction of the National Socialist Council of Nagaland (NSCN-K)? Can a raid of this quantum be replicated when militants transgress the Line of Control to attack civilians and army personnel in Jammu & Kashmir? These are difficult and complex questions and need a sober and studied response. But regrettably the hotheads are already running away with the rhetorical ball. Rajyavardhan Singh Rathore, Minister of State in the Modi Government, for example, answers both the questions in the affirmative. The Army’s unconscionable delay in acquiring modern small arms severely compromises the infantry’s operational efficiency, especially in counter-insurgency warfare. In the last five years, the small arms profile of India’s paramilitary forces has emerged as significantly superior to that of the Army, which continues to struggle to acquire even basic weapons for its infantry units. 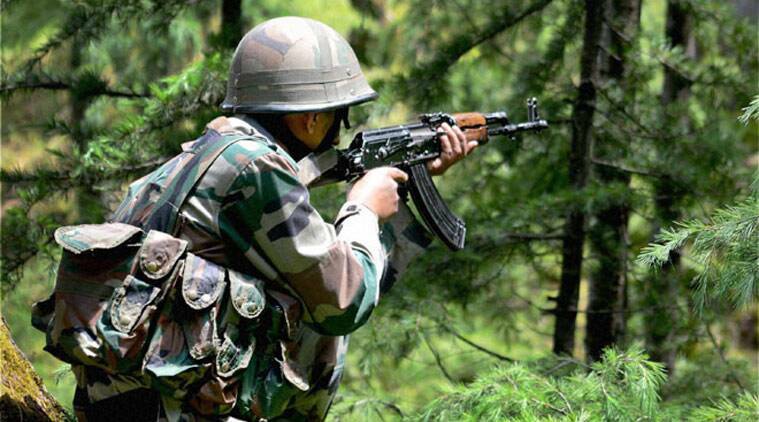 Since 2010, the Army has operated without a carbine, and has been battling seemingly intractable Ministry of Defence (MoD) bureaucratic processes to procure one. It is also struggling with similar self-defeating and hidebound acquisition procedures to acquire an assault rifle. It is still years away from selecting one, let alone inducting it into service. Succeeding Army chiefs have declared the procurement of both weapon systems to be ‘top priority’, but years later, following extended trials and interminable evaluations, this priority remains unfulfilled. Where has the initial positivity gone? Efforts to play up hostility can only lead to jingoism AFPTHE escalating war of words between India and Pakistan will do good to neither side; on the contrary it could cause incalculable harm to people of both countries. 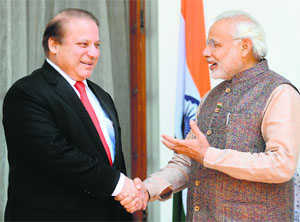 Pakistan was too easily provoked by the disclosures/confessions of the Modi sarkar. Each time New Delhi has recalled an episode from the history of confrontation between the two closest neighbours, the hawks on this side have welcomed the opportunity to revive their confrontational narrative. A better response could have been a dispassionate analysis of the Indian strategy. Prior to 20th century guerrilla warfare was regarded as purely military form of waging war. It was the weapon of the weak against the strong. The guerrillas employed ‘hit and run’ tactics against their adversaries. This form of warfare was also applied to the role of irregular troops acting as partisans in support of conventional forces. Counter-insurgency operations have provided the staple operational fare for the Indian Army more than any other, except, perhaps, the Israeli Army, and yet it has not received the attention it deserves. In most armies counter-insurgency operations are regarded unglamorous, where success cannot be easily measured and results are not immediately visible. Host and editor Ankit Panda speaks to Jeff Smith, the director of Asian Security Programs at the American Foreign Policy Council, about India-Japan relations and India’s relationship with the United States and China. The conversation begins with a discussion of perceptions of New Delhi in Tokyo and vice versa. Smith and Panda discuss Indian foreign policy under Narendra Modi more broadly, including toward China. The conversation additionally focuses on the topic of trilateralism between India, Japan and the United States, and India, Japan and Australia. Click the arrow to the right to listen. You can also subscribe to The Diplomat’s Asia Geopolitics podcast on iTunes here. If you like the podcast and have suggestions for content, please leave a review on iTunes. India’s first indigenously built aircraft carrier, the INS Vikrant, hit a major milestone this week. Marking a symbolic milestone, India’s INS Vikrant, its first indigenously built aircraft carrier and the first of two planned Vikrant-class carriers, undocked at Cochin Shipyard. As of this week, the INS Vikrant, with a completed hull and internal structure, is free-floating and will go into static and dynamic trials soon. The vessel was officially launched in August 2013 when it completed the first phase of its construction. Its undocking marks the successful conclusion of its second phase of construction. The carrier, which first left its dry dock in December 2011, is expected to have fully completed construction by 2016 and to be commissioned in 2017. WHY DOES PAKISTAN ACCUSE INDIAN SPIES OF TERRORISM? Several weeks ago, the Pakistani armed forces accused India’s intelligence agency, the Research and Analysis Wing, or RAW, of fomenting terrorism. Accusing Indian spies of subversive and nefarious activities in Pakistan is an age-old practice. Such charges afford Pakistani officials a means of shielding themselves from blame for their country’s ills. They also convey a reassuring Muslims-cannot-be-responsible-for violence message that plays well among the general population. Yet, these accusations go well beyond terrorism. Pakistanis have constantly conjured up conspiracies that deposit blame for all manner of misfortune — from floods to fraud scandals — on India’s doorstep. Prime Minister Nawaz Sharif held an All Parties Conference on 1 June to form a consensus on security related issues in Balochistan province. Security in Balochistan has become of paramount importance since the announcement of the China Pakistan Economic Corridor (CPEC), which runs largely through Balochistan and is expected to bring USD45 billion from China in infrastructure and energy investment to Pakistan. On May 20, Pakistan announced that it had arrested four suspects in connection to the gunning down of 46 minority Ismailis aboard a bus in Karachi and the assassination of Sabeen Mahmud, a Pakistani activist. Many were surprised that Saad Aziz, one of the arrested militants, came from a privileged and educated background. With Aziz having confessed to his involvement in both attacks, the question remains: What led him down this path? Aziz’s privileged background as a graduate of Pakistan’s top business school should not have been a surprise. Many prominent terrorists in recent history have been born to Pakistani parents and well-educated, including Khalid Sheikh Mohammed, the mastermind behind the 9/11 attacks, who graduated from North Carolina Agricultural and Technical University, and Omar Saeed Sheikh, the man responsible for the brutal murder of Wall Street Journal reporter Daniel Pearl, was a master chess player and graduate of the London School of Economics. So far this year civilian casualties are 50 percent higher than last year. Over 300 civilians a month are dying, mostly because of Taliban and drug gang efforts to terrorize civilians into supporting, or at least not opposing them. Casualties are up for the security forces as well but Taliban and drug gang losses are up the most (over 80 percent compared to last year). For example in May over 4,600 “hostile individuals” were killed. The drug gangs and their Islamic terrorist allies (mainly the Taliban and Haqqani Network) are desperate to resist increased effort by Afghanistan and Pakistan to destroy the power of the drug lords. Meanwhile the Taliban have a growing problem with former Taliban (including most of the non-Afghans, mainly from Central Asia and Chechnya) who have left to form local branches of ISIL (Islamic State in Iraq and the Levant). It was recently revealed that on June 3rd a group of Taliban in the east (Nangarhar province) were ambushed by ISIL members and ten of the Taliban were eventually found with their heads cut off. The Taliban tried to keep this a secret but the news got out and spread. ISIL has declared war on the Taliban and justified it with accusations that the Taliban were created and still work for Pakistan. This is largely true, but the Taliban also work for local drug gangs. Gen Sharif please note, PoK is India's unfinished business in J&K The neighbouring state's agenda should rather be on ensuring its own regions don't break away. Pakistan's army chief General Raheel Sharif lost his brother, Major Shabbir Sharif, in the 1971 Bangladesh war of liberation. Former Pakistan president Pervez Musharraf was then a company commander of the elite Special Service Group (SSG) commando battalion, but did not take part in the war in Bangladesh. Raheel Sharif himself was just 15 years old then. The death of his older brother fighting the Indian Army in Bangladesh in 1971 left a life-long scar on young Sharif. In Musharraf, however, Raheel Sharif found a mentor when he was commissioned into the Pakistani army in October 1976. Musharraf had been Major Shabbir Sharif's course-mate. At every stage of Raheel Sharif's career, Musharraf ensured his protégé received regular promotions. It was Musharraf who promoted Sharif to the rank of Major-General before he was forced to resign as president of Pakistan in 2008. A grateful General Sharif last year halted Musharraf's treason trial initiated by Prime Minister Nawaz Sharif who Musharraf had deposed in a coup in October 1999. Defence Minister Manohar Parrikar’s penchant for off-the-cuff remarks will one day land him in trouble. His flip-flop on Rafale has become the most celebrated case of confusion. He should remember that every question need not be answered, least of at all, accompanied by a simile. His predecessor, Mr AK Antony, chose the other extreme of keeping a maun vrat. In response to a question at a recent conclave on what India would do in the event of a terrorist attack from Pakistan, he replied: “We will prevent it from happening”. This was perhaps the most original antidote to one of the gravest security challenges facing the country. National Security Advisor Ajit Doval did one better by warning Pakistan: “You do another Mumbai; you lose Balochistan”. The signaling is astounding. In the past, the top leadership would provide a stock response to a terror attack — “there will be severe consequences”. Intelligence reports also suggest new cultivation areas are opening up in Sagaing, adjoining Myanmar’s borders with Manipur and Nagaland. Lo Hsing Han, emperor of poppy, was laid to rest in a glass coffin, watched over by his wife, four sons, four daughters and 16 grandchildren as top government officials, business leaders and local residents lined up to pay their respects. From his infamous days as Southeast Asia’s biggest heroin trafficker, Lo was brought into the system, emerging at the head of one of Myanmar’s biggest industrial conglomerates. The story, it seemed at the time, held out hope. But like an apparition in an opium-induced nightmare, the emperor of poppy has been reborn — now called Pheung Kya-shin, leader of an army that has been locked in fierce combat with Myanmar’s armed forces through the eastern Kokang region since February. Fighting, waged with artillery and combat jets, has forced tens of thousands of local people out of their homes. 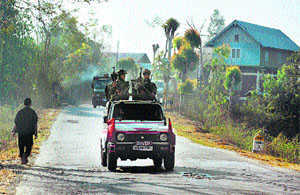 The Indian army’s recent operations against militants along its eastern borders remains largely shrouded in mystery and continued to cause controversy on Thursday, two days after special forces crossed the border into Burma (officially known as Myanmar) and inflicted “significant casualties” at two bases belonging to insurgents there. The Burmese government denied the operation completely, with a Facebook post from the director of the president’s office reportedly saying that according to their information the operation was performed only on the Indian side of the border. “Myanmar will not accept any foreigner who attacks neighboring countries in the back and creates problems by using our own territory,” he said,according to Indian local media. It is still unclear how much of the Indian operation Burma was privy to, but a senior Indian military official had said on Wednesday that authorities from both countries had been in contact about the strikes. The back-and-forth allegations and denials, however, have created a degree of friction between two countries and armies that have generally been on good terms with each other. “It creates a problem for the Myanmar government,” Rumel Dahiya, deputy director-general of New Delhi-based Institute for Defense Studies and Analysis, and a former brigadier in the Indian army, said in an interview with TIME. Instead, Dahiya advocates greater coordination with the Burmese government, with the sharing of military intelligence and the planning of joint operations. “Doing these kinds of things repeatedly would become a problem unless they are on board,” he said. For the first time in three years, China and Japan held a bilateral finance dialogue. On Saturday, China’s minister of finance, Lou Jiwei, hosted his Japanese counterpart, Taro Aso (who is also Japan’s deputy prime minister) in Beijing for thefifth round of the China-Japan Finance Dialogue. It was the first time the previously annual dialogue had been held since April 2012 – rising tensions between the two countries delayed resumption of the dialogue for two years. The meeting between Lou and Aso was thus another welcome sign of a growing thaw in China-Japan relations. The two countries were barely on speaking terms for around two years, thanks to tensions arising from a territorial dispute in the East China Sea and from lingering historical issues. China was outraged in September 2012 when then-Prime Minister Yoshihiko Noda nationalized three of the islands by buying them from a private owner (though the central government claimed it did so only prevent Tokyo’s right-wing mayor from buying them). Things soured further after new Prime Minister Shinzo Abe visited the controversial Yasukuni Shrine in December 2013, causing China to cut off all high-level talks. At the recent Central United Front Work Conference, President Xi Jinping said that the government will change its methods and strengthen the united front work aimed at non-Party intellectuals, overseas students, and representatives of new media. This speech made a big splash. China’s public intellectuals and “Big Vs” (influential opinion leaders with verified social media accounts) became agitated, worrying that they would be “united” with the Party. It’s worth considering what’s behind this sentiment. After Xi’s speech, many netizens believe that the ultimate purpose of conducting united front work toward non-Party intellectuals and opinion leaders, those who are responsible for voicing criticisms, is to offer these figures amnesty, recruit them to the Party’s cause, and thereby eradicate different voices. Thus the critics will eventually voice a uniform opinion, just like China’s over 5,000 mainstream newspapers and periodicals and thousands of state televisions and broadcasting stations. This viewpoint breaks the “united front” into two sections: “unify” those who can be recruited and fight against those who can’t be. In the end, there will be only one voice left. No wonder many people consider “positive energy” to be the same as singing China’s praises. Secretary of Defense Ashton Carter’s plea to China and the nations surrounding the South China Sea toend island base building will fall on deaf ears for two reasons. First, it is in their respective interests to create facts on the water to establish sovereignty claims and, second, because no one can stop them. The United States explicitly declares that it takes no position on these activities as they relate to sovereignty claims; Washington simply wants to be free to sail in international waters and fly in international air space. On a wall facing dozens of cubicles at the FBI office in Pittsburgh, five guys from Shanghai stare from “Wanted” posters. Wang Dong, Sun Kailiang, Wen Xinyu, Huang Zhenyu, and Gu Chunhui are, according to a federal indictment unsealed last year, agents of China’s People’s Liberation Army Unit 61398, who hacked into networks at American companies—U.S. Steel, Alcoa, Allegheny Technologies (ATI), Westinghouse—plus the biggest industrial labor union in North America, United Steelworkers, and the U.S. subsidiary of SolarWorld, a German solar-panel maker. Over several years, prosecutors say, the agents stole thousands of e-mails about business strategy, documents about unfair-trade cases some of the U.S. companies had filed against China, and even piping designs for nuclear power plants—all allegedly to benefit Chinese companies. India’s Ministry of Commerce and Industry recently released its country-by-country trade data for fiscal year 2015. Alarmingly, the nation’s trade deficit with China has spiked by 34 percent to $48.5 billion—nearly 3 percent of the nation’s GDP. Download PDF file of "India’s Trade Reality: Goods Trade Imbalance with China Spikes"
WITHIN the past decade, Asian cities have become the centre of the world's urbanisation trend. Today, 36 cities have populations exceeding 10 million. Twenty of these mega-metropolises are in the Asian region, including three in South-east Asia: Jakarta, Manila and Bangkok. As new challenges emerge daily, what are the key strategies being implemented by South-east Asian cities to ensure their success into the next century? Asian cities are experiencing a population growth that is more than double the size of the urban migration in Europe and America. Population surges of this magnitude are causing cities to explode in size and density. Cities are expanding into urban corridors, patches and clusters that cover over 5 per cent of the world's surface area, creating hubs of inter-city movements and inner-city innovations that extend beyond national borders. In past decades, the pace of South-east Asian urbanisation has been slow when compared with Asian giants Delhi, Beijing and Seoul. However, the tides are quickly turning. While South-east Asia's urban population is just reaching the 50 per cent mark, there is now a mass urban immigration so rapid that it is said that Indonesia's urban population will reach 82 per cent of total population by 2045, 12 per cent higher than the global average of 70 per cent estimated by the United Nations for 2050. Megacities lead immediately to urban sprawl that is unlikely to be confined into tight controllable areas. Reactive policies to population growth and climate change are proving inadequate. However, in response, South-east Asian cities are taking charge with flexible governments, resourceful citizens and local infrastructure innovation. ASIAN city leaders have demonstrated that flexibility and adaptability are core attributes for efficient governance needed in fast-growing metropolises. The United States and its allies may be killing thousands of Islamic State militants from the air, but the Islamist extremist group is recruiting at least as many fighters for its war in Iraq and Syria as it is losing, experts say. Those recruits include foreign fighters from across the wider Middle East and beyond, jihadis from the areas of Iraq and Syria that the Islamic State controls, and other militant groups in both states that are pledging allegiance to the group. And focusing on the enemy body count ignores other trends that are pointing in the wrong direction for the U.S.-led coalition, according to the experts. Alexander Schade is a Middle East Foreign Area Officer with the U.S. Army. The views expressed are his alone, and do not reflect those of the U.S. Army, the Department of Defense, or the U.S. Government. As the eve of an unprecedented meeting at Camp David approaches, I found myself reminiscing over a discussion highlighting the strategic interests of the U.S. in the Middle East. The best way, as put by Dr. Stephen Walt, to attain our strategy goals in the Middle East is to act as an “offshore balancer” in the region, shedding ourselves of special relationships and attempts at regional re-alignment. Our forays into shaping the Middle East through favoritism, exclusionary alliances, and local power balancing have stalled our progress in achieving strategic interests, and are limiting our partners in the Middle East from accomplishing theirs. Our successes in the past are a direct result of a more flexible approach to our relationships in the region, and with the approaching Camp David summit we have the opportunity to refine our strategic approach to the Middle East. Islamic State, one year on: Where do its fighters come from? Thousands of foreign fighters have travelled to Iraq and Syria in the year sinceIslamic State of Iraq and the Levant’s (Isil) lightning sweep through the two territories. According to the most recent publicly available estimates, released by King’s College London’s International Centre for the Study of Radicalisation in January,Tunisia has contributed the largest contingent, with some estimates putting the figure as high as 3,000. Let me begin by thanking the Chairman, Ranking Member, and members of the Subcommittee for the opportunity to testify today on what I believe is a critical aspect of the military balance in the Gulf and the potential threat that Iran can pose to its neighbors and the U.S. I have prepared a formal statement describing the Iranian missile threat and addressing what is and is not known in the unclassified domain regarding the full range of Iran’s artillery rockets, ballistic missiles, and cruise missiles. I respectfully request that this be included in the record. The feeling is growing in the international commentariat that the Islamic State may win: That the group will continue to gain territory in Syria and Iraq and will consolidate a permanent government, a state ensconced in the Islamic caliphate its leadership has proclaimed. I ended a recent article on a note of bravado, writing that in spite of its successes on the battlefield and elsewhere, it remains all but certain that Islamic State will ultimately be ground up and destroyed. Today I am less certain, and I have started to imagine what would happen if ISIS actually prevails. Here are some of Mr. Obama’s statements about the American strategy to confront the Islamic State and its effectiveness. It’s time to ponder a troubling possibility: What should we do if the Islamic State wins? By “wins,” I don’t mean it spreads like wildfire throughout the Muslim world, eventually establishing a caliphate from Baghdad to Rabat and beyond. That’s what its leaders say they are going to do, but revolutionary ambitions are not reality and that possibility is particularly far-fetched. Rather, an Islamic State victory would mean that the group retained power in the areas it now controls and successfully defied outside efforts to “degrade and destroy” it. So the question is: What do we do if the Islamic State becomes a real state and demonstrates real staying power? Journalist Robert Kaplan briefly broke the (national security) Internet with a Foreign Policy article that seemed to call for a return to imperial governance as an alternative to the “chaos” in the Arab world today. This is not Kaplan’s first attempt at making this case, and now, as then, his writing sparkedwithering and important rebuttals. As the nuclear negotiations with Iran enter what may be their final lap, diehard opponents of any agreement with Tehran have been leaning more heavily than ever on the theme that Iran is a nasty actor in the Middle East intent on doing all manner of nefarious things in the region. Insofar as the theme is not just an effort to generate distaste for having any dealings with the Iranian regime and purports to have a connection with the nuclear agreement, the idea is that the sanctions relief that will be part of the agreement will give Iran more resources to do still more nefarious stuff in the region. Several considerations invalidate this notion, just on the face of it, as a reason to oppose the nuclear agreement. The chief one is that if Iran really were intent on doing awful, destructive things in its neighborhood, that would be all the more reason to ensure it does not build a nuclear weapon—which is what the agreement being negotiated is all about. 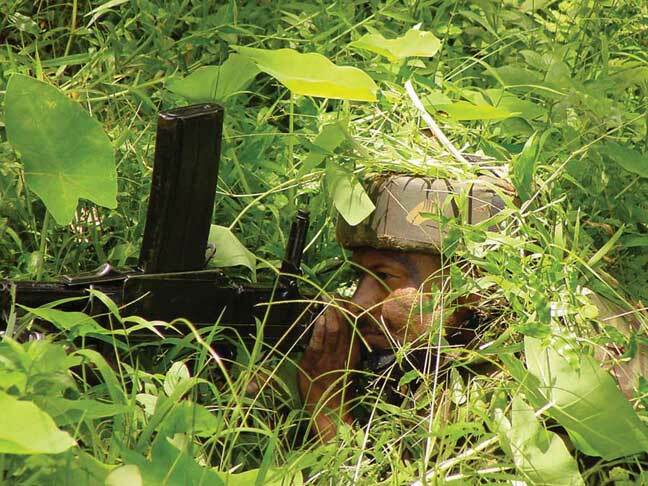 The June 9 operation into Myanmar against Naga insurgents was by all accounts very professionally executed. It showed coordinated and skillful action, presumably based on pinpointed intelligence. In addition there was a welcome show of political will. The impression also was that the Myanmar government was in the loop on this one, as all friendly governments would be in such cases. One grew up having been taught that special operations were a discreet affair, always with plausible deniability but the message was delivered to those who needed to be told or “fixed”. There was no public thumping of chests. The boys just went home and celebrated quietly in their messes with their own kind. Intelligence Check: Just How 'Preposterous' Are China's South China Sea Activities? It’s time for the Pentagon to issue a sober and balanced public assessment on the South China Sea territorial disputes. On 27 May 2015, Admiral Harry B. Harris Jr, the newly promoted Commander of the U.S. Pacific Command, said that one of his main challenges, alongside a nuclear armed and erratic North Korea, would be “China’s preposterous claims to and land reclamation activities in the South China Sea.” So now a coral reef with an airfield is as dangerous as a nuclear weapon? Harris’ statement was widely interpreted as meaning that China was engaged in an unjustified land grab, tantamount to coercion of or even aggression against the country’s southern neighbors. Three days later, a Chinese general repeated to the Shangri-La Dialogue in Singapore that China has shown “great restraint” in defending its territorial claims against unreasonable derogation by its southern neighbors. China sees its actions as defensive and in no way constituting aggression. There is a highly significant discrepancy between the two assessments. If Harris is wrong about the Chinese motivation, this must represent a significant intelligence failure by the United States. There is nothing more essential to national security intelligence than a correct assessment of a potential adversary’s motivations (intent) in the military sphere. President Park Geun-hye postponed a planned trip to the U.S. due to domestic concerns over the viral outbreak. South Korean President Park Geun-hye has postponed a planned trip to the United States as the Middle East Respiratory Syndrome (MERS) virus spreads in South Korea. Park originally would have visited the United States from June 14-19, visiting Washington D.C. and Houston, Texas. KIEV — In waging a clandestine war in eastern Ukraine, Vladimir Putin has made a bargain with the devil. He has farmed out much of the fighting to warlords, mercenaries and criminals, partly in an attempt to simulate a broad-based indigenous resistance to Ukrainian rule. But Mr. Putin’s strategy of using such proxies has resulted in the establishment of a warlord kleptocracy in eastern Ukraine that threatens even Moscow’s control of events. Surrogate fighters were recruited from four sources: local criminal gangs; jobless males who live on the fringes of eastern Ukraine’s society; political extremists from Russia’s far right, including Cossacks; and itinerant Russian mercenaries who fought in Chechnya, North Ossetia, Transnistria and other regional conflicts in the post-Soviet Union. They have been trained and equipped with modern weapons, and are often supported by Russian regular and special troops. Francisco Sanchez discusses the Trans-Pacific Partnership and U.S. economic relations with major Asian economies. The Diplomat‘s Ankit Panda spoke with Francisco Sanchez, former under secretary of commerce for international trade at the Department of Commerce in the Obama administration, about the Trans-Pacific Partnership and the United States’ economic relations with major Asian states. The Diplomat: The Trans-Pacific Partnership (TPP) has been described as the “economic” leg of the Obama administration’s ongoing rebalance to Asia. Could you describe how, in concrete terms, a concluded TPP would aid long-term U.S. strategic goals in the Asia-Pacific? What's the Price of Tajik Electricity in Kyrgyzstan? It’s reportedly been settled: Kyrgyzstan will pay 2.5 cents per kWh, up from 2.0 cents last summer. After three months of negotiations, Tajikistan and Kyrgyzstan have reached an agreement on price for Tajik electricity flowing into Kyrgyzstan this summer,24.kg reports. Kyrgyzstan will pay its neighbor 2.5 cents per kWh, up from last summer’s rate at 2.0 cents but short of Tajikistan’s original proposed rate of 3.5 cents. According to the Kyrgyz Deputy Minister of Energy and Industry, Aybek Kaliyev, Tajikistan will supply Kyrgyzstan with 500 million kWh of electricity from June to September. Asia-Plus notes that Kyrgyzstan is also importing electricity from Kazakhstan this summer–at 7.0 cents per kWh. To help fight terrorism, should instant messaging firms give a backdoor key to the FBI to encrypted messages? Islamic State militants and their followers have discovered an unnerving new communications and recruiting tool that has stymied U.S. counter-terrorism agencies: instant messaging apps on smartphones that encrypt the texts or destroy them almost immediately.